The AGMSC or Appalachian Gas Measurement Short Course is August 1-4 at the Robert Morris University in Moon Township Pennsylvania. Stop by the GPL Odorizer booth and learn about our new low-flow and intermittent-flow odorizer, the GPL 750. GPL Odorizers manufactures odorant injection systems for natural gas that are self-contained offering a more environmentally-friendly approach to gas odorization. Stop by our booth (#111) and meet Brian Cox, Jeffrey Cox, Garrett Cox, Russ Isaac and Preston Marcoux who will be available to demonstrate our new GPL 750, a low-flow (even no-flow) and intermittent-flow odorant injection system. 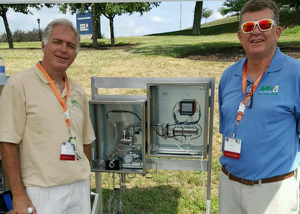 Stop by the GPL Odorizers booth at the Appalachian Gas Measurement Short Course (AGMSC) at the Robert Morris and meet Brian Cox (left) and Jeffrey Cox (right). For more information visit https://www.agmsc.org/. The Appalachian Gas Measurement Short Course is an annual conference giving anyone in gas measurement an opportunity to learn from industry leaders and vendors in both lectures and hands-on classes. These courses are intended to educate the technicians, engineers, supervisors, field workers, government regulators, accountants, marketers, vendors, and many others within the industry.